New Delhi: The ongoing battle between the ministry of defence (MoD) and the department of telecommunications (DoT) over 3G spectrum has taken a new turn. DoT has rejected the defence ministry’s claim that it holds all the spectrum (1920-1980Mhz) that is needed for the long-delayed auction of frequencies required for third-generation (3G) mobile phone services that’s set to be held next month. “DoT does not agree with the ministry of defence that the entire 60Mhz of spectrum in the 1920-1980Mhz band, pan India, is with the defence (ministry) and that only 10Mhz 3G spectrum released by the defence (ministry) on signing of MoU is available for auction," said an internal note drafted by DoT for the empowered group of ministers (eGoM) on 3G, headed by finance minister Pranab Mukherjee. A copy of the note was reviewed by Mint. DoT contends that it has a minimum of 15Mhz (three slots) of spectrum available for auction in telecom operating areas, except in the North-East, West Bengal (10Mhz) and Rajasthan. 3G spectrum refers to the spectrum needed by telecom service operators to provide faster data capabilities as well as better voice capabilities. The auction of 3G spectrum has been hanging for at least two years and the auction date has been postponed four times. The next date of 14 January is expected to be postponed again by a few weeks, though the government is yet to take a final call on the issue. “The potential bidders need to know what they are bidding for—the frequencies that are up for bidding," a senior DoT official said on condition of anonymity, as he is not authorized to speak to the media. “It depends on the defence ministry and the eGoM on the date," another senior DoT official said, also requesting anonymity. Earlier this week, the defence ministry told DoT that only 10MHz of 3G spectrum could be vacated and that it was still using the frequency allotted to state-owned Bharat Sanchar Nigam Ltd (BSNL) and Mahanagar Telephone Nigam Ltd (MTNL). This would mean the spectrum available for auction on 14 January can accommodate only one private operator. As per the decision of the eGoM on 3G, four private operators were to be able to get spectrum from the auction. 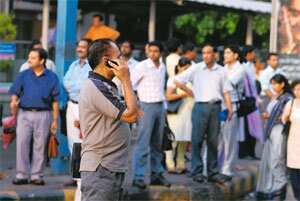 MTNL and BSNL have already been allocated spectrum for the auction. DoT has refuted the defence claim. “There seems to be a lot of confusion within and outside the government over the auction. The constant delays and the lack of clarity over the policy has already led to many losing interest in the auction," said a senior analyst with a Delhi-based strategy consulting firm, who didn’t want to be named because of the sensitive nature of the issue. “The fact that there is this much confusion so close to the auction date and that they seem to have no idea what they have to auction is just making the government look incompetent to the rest of the world." DoT has proposed to the eGoM that it allow for an auction of three slots and not the four as was decided earlier, rather than wait for the defence ministry to vacate spectrum, senior DoT officials said. It has also proposed auction of two slots of 3G spectrum in Rajasthan and the North-East after getting 15Mhz from the defence forces. There was no slot available for auction earlier in these areas. “Good auction practice requires that only spectrum that is available should be auctioned or else the auction may result in discounted bids causing revenue loss to the government," says the internal note prepared by DoT. The defence ministry, under the Memorandum of Understanding (MoU) signed in May, had agreed to vacate 10Mhz of 3G spectrum immediately, and another two slots of 5Mhz at certain trigger points or milestones reached in the building of an alternate optical fibre cable (OFC) network for the defence forces. The network is being built by BSNL and MTNL at a cost of almost Rs10,000 crore in lieu of the spectrum being vacated by the defence ministry.